Presenter: Dr Tshepo Madlingozi, Department of Jurisprudence, University of Pretoria. 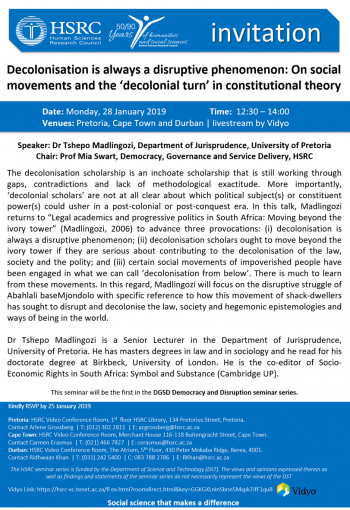 “Legal academics and progressive politics in South Africa: Moving beyond the ivory tower” (Madlingozi, 2006) to advance three provocations: (i) decolonisation is always a disruptive phenomenon; (ii) decolonisation scholars ought to move beyond the ivory tower if they are serious about contributing to the decolonisation of the law, society and the polity; and (iii) certain social movements of impoverished people have been engaged in what we can call ‘decolonisation from below’. There is much to learn from these movements. In this regard, I will focus on the disruptive struggle of Abahlali baseMjondolo with specific reference to how this movement of shack-dwellers has sought to disrupt and decolonise the law, society and hegemonic epistemologies and ways of being in the world. 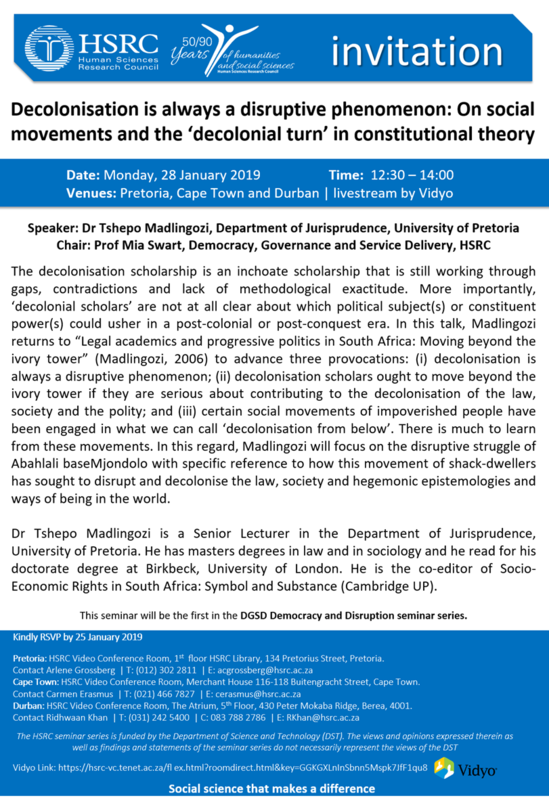 DrTshepo Madlingozi is a Senior Lecturer in the Department of Jurisprudence, University of Pretoria. He has masters degrees in law and in sociology and he read for his doctorate degree at Birkbeck, University of London. He is the co-editor of Socio-Economic Rights in South Africa: Symbol and Substance (Cambridge UP).